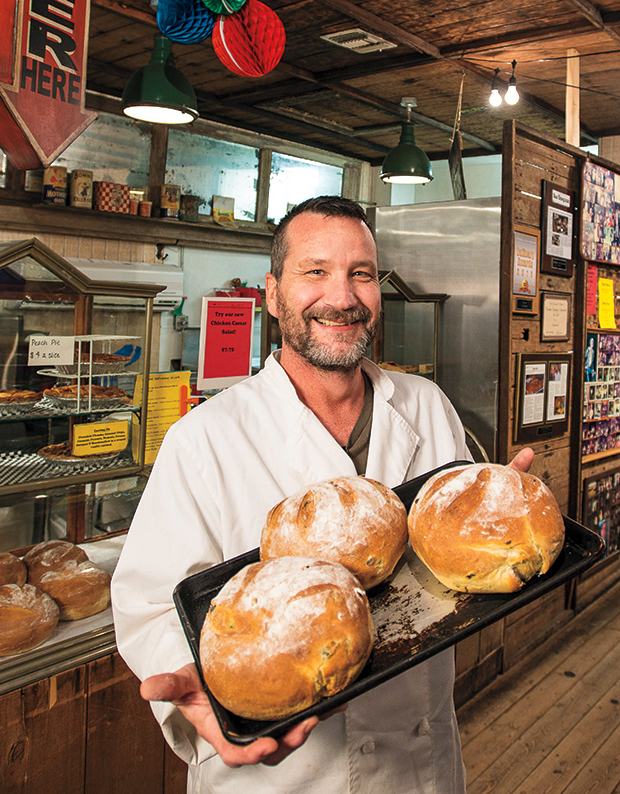 The Shed owner Jeff Carr spent a year learning the art of baking before opening his eatery. Author Roald Dahl wrote, “the greatest secrets are always hidden in the most unlikely places.” And when it comes to divine grub located in an unlikely shop, his words ring true. The Shed at David’s Stove Shop is at 4019 Fort Worth Highway (I-20) in Hudson Oaks. Hours: Tue–Sat 10:30 a.m.–2:30 p.m. Call 817/594-5533. Stir together, and pour in prepared deep-dish pie shell. Bake at 350° for 25-30 mins until golden brown and set. You may cover with a foil tent after 20 mins to prevent over browning. Twenty miles west of Fort Worth on Interstate 20, David’s Stove Shop is a jackpot for antiques, wood stoves and grills, decor, and just about anything under the sun. And while many visitors come for the one-of-a-kind shopping, the store has seen an explosion of guests in the past few years thanks to the addition of The Shed, tucked away in the west side of the building. After arriving with a friend and not seeing a sign anywhere noting The Shed’s location, we follow our noses. Walking through the Stove Shop past rows and rooms of trinkets, the scent of fresh sourdough and jalapeño bread intensifies. While cooking always came naturally to Carr, he’d never worked with bread and decided to challenge himself. He spent a year learning the science behind bread making, and then began bringing his breads out to David’s Stove Shop on Saturdays when owner and longtime family friend David Clack makes briskets and ribs for grill demonstrations. Slowly but surely, Carr built a cult following. The Shed came into being after Carr went from joining Saturday grill demonstrations to operating full-time. After clearing out a little room in the west end of the building, he opened up shop in November 2011. Through word-of-mouth alone, The Shed has grown from four or five tables and a bakery case to about 10 tables, a bakery case and, a constant stream of hungry patrons. “If you’d have told me when we first started that people would line up for 45 minutes to order, I would’ve told you that you were crazy,” Carr says. After making our way through the line, we snag a booth and wait for lunch. My eyes dance across the walls at the eclectic merchandise: Western photos featuring windmills and saddles, metal hubcaps, antique oatmeal containers, and glowing string lights. Also proudly displayed are awards stating “Best Bread” and “Parker County’s Favorite Sandwich.” I watch the staff buzz around carrying trays when one stops at my table and delivers my side order of the soup of the day: fire-roasted red pepper cream. The smooth soup hits the spot, and it’s all I can do to not devour all of its velvety goodness before my main dish comes. As my lunch buddy slows down on his chips, our main courses arrive. Everything about the food screams homemade, from the grilled, buttery, jalapeño bread nestling the thick-carved turkey and gooey white cheese on my hot turkey melt ($6.75 for the small, $8 for the large) to my friend’s monstrous hot roast beef sandwich ($7.50 for the small, $9 for the large). The soft bun hugs a huge portion of hot roast beef, cheese, and grilled peppers and onions. My friend struggles to fit the sandwich in his two hands. Intrigued, I taste his sandwich but not before dipping it in the au jus on the side. It’s every bit as good as my melt, if not better. This is exactly how Carr wants his food to be, and he works hard creating this homespun experience. “We prepare all of the breads ourselves. We make our own meats for sandwiches. We smoke our own turkeys and cook our own roast beef,” Carr says. He likes to have a hand in everything that comes out of the kitchen, whether it’s a brisket taco special or a fried bologna sandwich. Between The Shed’s incredible eats and the finds at David’s Stove Shop, this spot is a destination in itself, and people love to think it’s their own hidden gem. “We don’t have a sign, we don’t advertise, you have to have heard about it or find it. People have a kind of ownership over it simply because they had to find it,” Carr says. Walking around David’s Stove Shop after lunch, I find many intriguing items to avert my attention from my full belly. I stop to check out an antique barber chair, metal yard decor, cast-iron pans of all shapes and sizes, and a room of wooden rocking chairs, among other treasures. Back on the road, I think about how great it is to know about such a place and vow not to tell anyone. Then, I take out my phone and invite another friend for next week because I want everyone in on this little secret.